I think PC Building Simulator might be one of the most important enthusiast tools since the advent of PCPartPicker. It’s been almost exactly a year since we last checked in with PC Building Simulator. A productive year, it seems. What was once an extremely rough “pre-alpha build” on itch.io is now a more polished $20 Early Access production on Steam. Yes, you can buy it and start assembling your own dream PCs right now, complete with dozens of licensed parts. There’s even the skeleton of a career mode. And I don’t want to get too far ahead of myself, but I think PC Building Simulator might be one of the most important enthusiast tools since the advent of PCPartPicker. It’s one part tutorial, one part visualizer, and one part wish fulfillment—a perfect blend. First things first: Forget the career mode. It’s not bad per se, but it’s there seemingly to satisfy the niche who want to purchase PC Building Simulator as a game. I’m sure that niche exists, but for me at least, “All the fun of running your own small-scale PC repair shop” isn’t really a draw. I played around with it for about 40 minutes, cleaned viruses off a few PCs, installed a graphics card for one high-rolling customer (they bought a GTX 970), and quickly realized that fixing other people’s PCs is about as fun digitally as it is in the real world. Which is to say: It’s always the most boring components that fail and need replacing. Ah yes, the thrill of blowing out the dust and checking for viruses on your dentist's gaming PC. So forget it. It’s there if you want it, but it’s the “How to Build a PC” and “Free Build” modes that I’ve put the most time into this week. There are a bevy of resources to help first-time builders get started, but they’re all hands-off. Text tutorials and forum posts are a good entry point. Photo-based tutorials help even more. And for the last decade or so, YouTube and other video-based builds have talked a lot of people through their first builds. 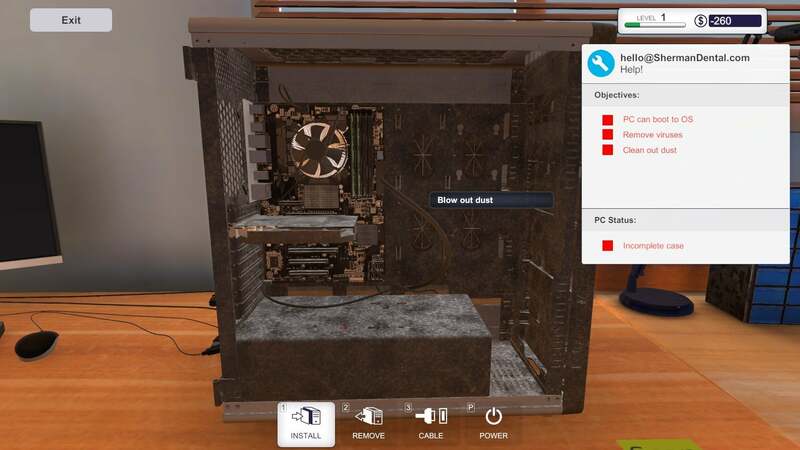 PC Building Simulator ’s coup though is that it’s interactive. You put a motherboard into a case—and have to screw the stand-offs in first. You slot the RAM in, and need to push back the tabs on the motherboard beforehand. Don’t forget to pull the little metal guards out of the case before installing your graphics card! The “How to Build a PC” mode talks you through these steps and more, using a limited selection of predetermined hardware. All the basics are there though, and the simulation is granular enough to, for instance, require you to remove the thumb screws from rear of the case before pulling the side panels off. Every component you pick up is also festooned with tooltips that teach you a bit more about the hardware you’re dealing with. 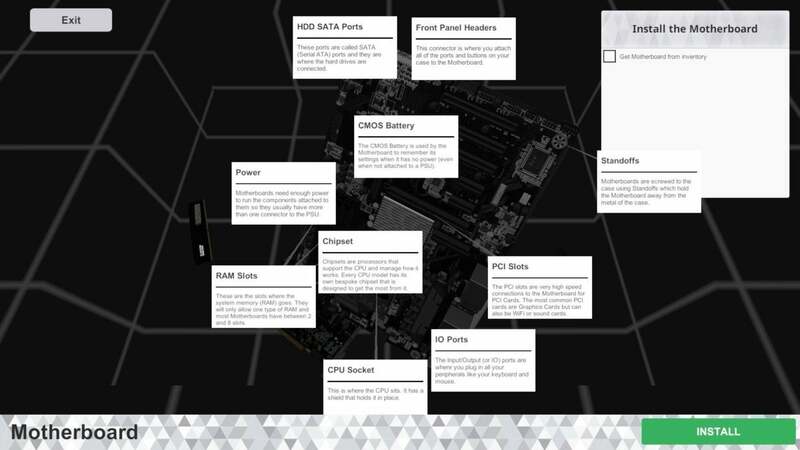 For instance, the motherboard will give you background on the CMOS battery, the CPU socket, RAM slots, PCI-e slots, and so on. It also points out what these look like on a normal motherboard, with arrows to direct you to the CPU socket for instance. It’s the type of lingo more experienced builders throw around in tutorials without thinking twice, so it’s great to have PC Building Simulator break it down to the fundamentals. Which is not to say it’s perfect. Not yet, at least. Again, this is Early Access so I expected even more changes will come eventually. There are some baffling choices though. For instance, the game currently has you install the motherboard into the case while it’s standing up, then install the CPU into the motherboard while it’s still standing. That’s a quick ticket to ruining your CPU. Hopefully the physics of that act would dissuade your first-time builder from copying such an asinine action, or an external tutorial would teach them the right way. For a mode called “How to Build a PC” though, it seems a bit irresponsible to portray any key step in such a dangerous fashion. Protip, for first-timers reading this: Install your CPU into your motherboard and then your cooler onto your CPU before you even put the motherboard in your case. You’ll appreciate it later. It’s also not quite nuanced enough yet to talk you through some of the more complicated parts of a build. Cable management is about as hands-off as it was in last year’s demo, for example. You basically click two points and a cable magically appears between them, and not always routed in a way that makes real-world sense. There are also no sound effects, so I don’t think the simulation gives first-timers a good idea how much pressure seating a CPU or RAM usually takes. I remember my first-time jitters when my motherboard started creaking and cracking under the strain, and then my relief when it turned out that’s exactly how it was supposed to sound. And the bane of any first-time (or even nth-time) builder, the case front panel connectors, is greatly simplified here. Again, it’s like the rest of the cables—they just sort of magically appear. Worse, the game treats that whole region as a fused ten-pin block instead of a bunch of finicky two-pin connectors that are easy to accidentally attach upside-down. That step is one of the most common mistakes I’ve seen from first-time builders, so I hope the simulation adds more depth to that step eventually. Everything’s a lot more polished than last year though. It’s not quite “The only tutorial you’d need,” but the potential’s certainly still there, and in the meantime it’s definitely a great tool to play with before diving into a build. What about the more experienced builders, though? Here’s where PC Building Simulator gets really interesting. See, the other big change for Early Access is the inclusion of more real-world parts. Since last year, PC Building Simulator’s partnered with MSI, EVGA, AMD, Intel, Corsair, NZXT, Seagate, Cooler Master, SilverStone, and some other companies I’m sure I’m forgetting. It’s not an exhaustive list yet, but it’s getting there. 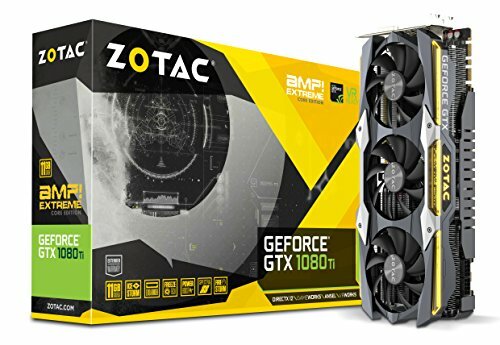 You want to build a PC with a 1080 Ti? You can build it. Want to experiment with Ryzen? That’s in there. 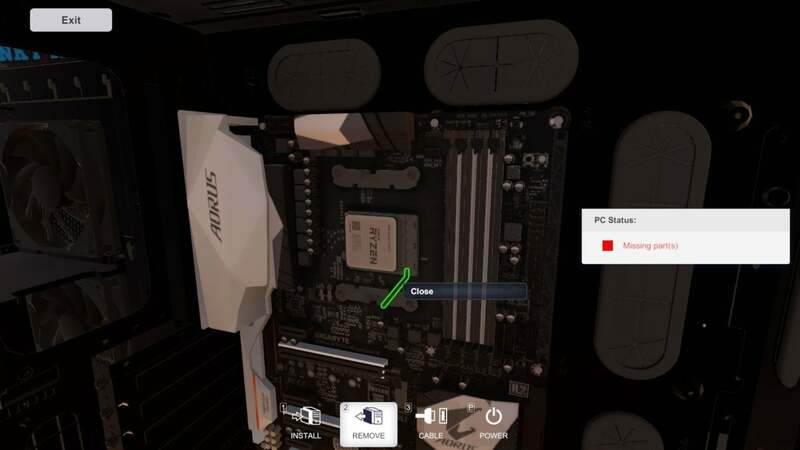 PC Building Simulator even keeps track of the same nuances as other PC building utilities. It’ll tell you, for instance, whether a specific motherboard is meant for Intel or AMD parts. It’ll even distinguish between different generations. Pick a Skylake motherboard, and it’ll only serve up Skylake CPUs. Case size is also taken into account. Small case? 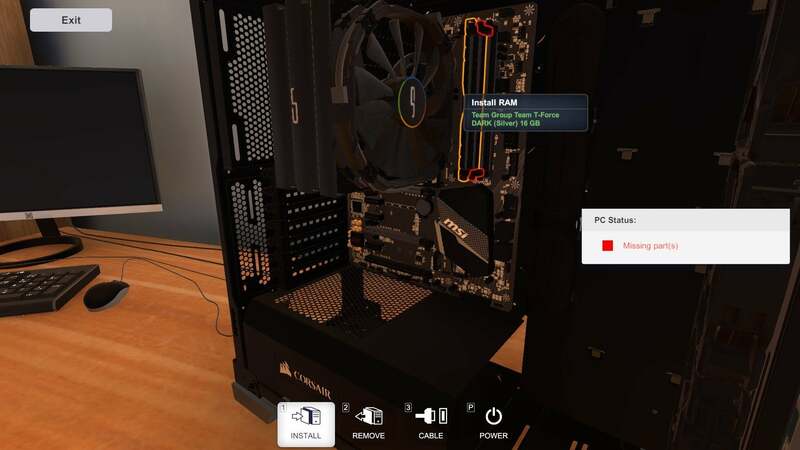 PC Building Simulator will tell you whether or not you can fit that oversized air cooler. Again, it’s not perfect. It’d be nice if you could access more details about the motherboard for instance—currently there’s no way to tell which RAM slots you should be using, or which ports are SATA III versus SATA II. The foundation is here though, and a ton of modeling work’s gone into rendering this many parts. It’s a damn cool feature. Sure, you can look up all this stuff online—PCPartPicker lets you pick out parts and ensure they’re compatible, benchmarking sites are a dime a dozen. Having it all in one place though, and with a visual representation of the hardware nearby, it’s way easier to parse. 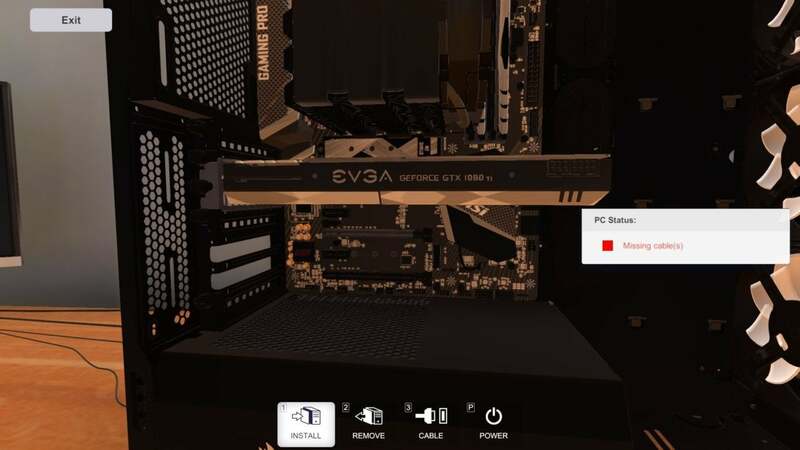 PC Building Simulator still needs work, of course. It’s Early Access for a reason. I’d love to see a more robust cable routing system, and quirks in its tutorials need to be worked out—some quicker than others. The potential is even clearer than last year though. Hell, I could see this going to even weirder places than it already has. 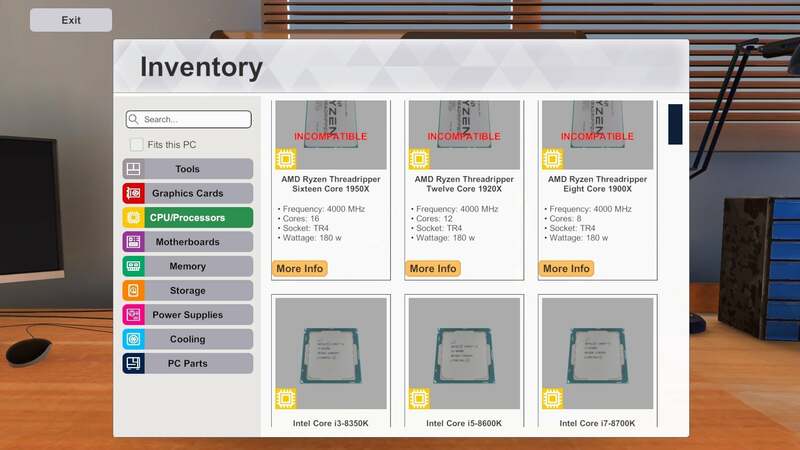 My colleague Gordon Ung and I had a long discussion about the potential for PC Building Simulator to fold in even more PCPartPicker-style features, from real-time price databases to links to external storefronts. It’d be tough and require a long-term commitment to updates, but one day this tiny simulation could be an all-in-one tool for anyone building a PC, and that’s pretty exciting for both novices and experts alike.